— The three most important tools in my studio are Improvisation, Spontaneity, and Intuition. If I can muster up the three at once when I am working there is a flow of honesty and creative union. The materials, the presence, and image of the work is unique and complete. If they are not present or only partially there, the work shows it. All art works are pieces of evidence of an ongoing investigation of something. In my case it is the interface of light and surface. I work with a lot of different materials but it is the surface of those materials that intrigues me. Life is made up of layers of things, in our body layers of tissue compose the structure of our physicality. In our personality layers of who we are and who we were and what we want to be determines our social presence. I use layers a lot in my works. In paper I use them as collage to reflect and absorb the light differentials that determine the image. When I do glass sculptures the layering is thin films of metals and quartz that interfere with the light that transmits, reflects or absorbs in the interface with the glass. I think of my sculptures as tapestries of those inherent qualities of a piece of glass. Larry Bell was born in Chicago in 1939. 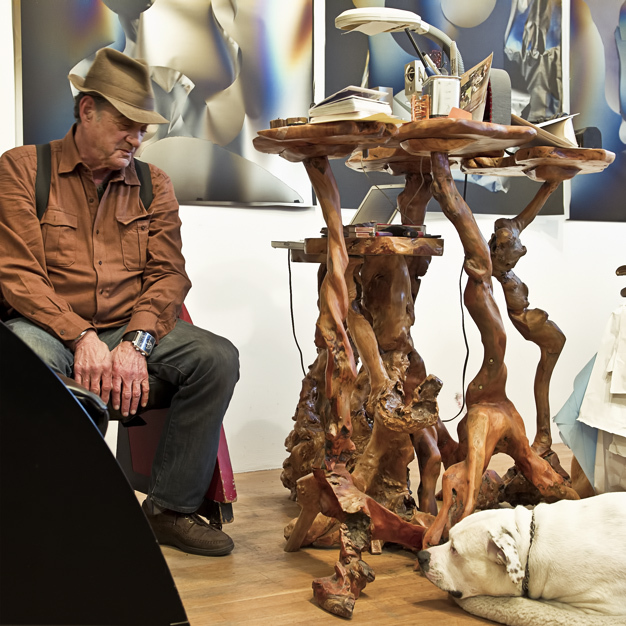 He lives and works in Taos, New Mexico and Venice, California. Bell is one of the most prominent and influential artists to have come out of the Los Angeles art scene of the 1960s, first showing at the Huysman Gallery, and then at Ferus. He has work in the permanent collections of the Museum of Modern Art, Musee d’Art Contemporain, Lyon, France, Whitney Museum of American Art, and Museum of Contemporary Art, Los Angeles, among many others. Bell was the recipient of the NM Governor’s Award for Excellence and Achievement in the Arts, 1990.